We at Tom’s here list out the quickest organic ways to give your bathroom the best cleaning done. 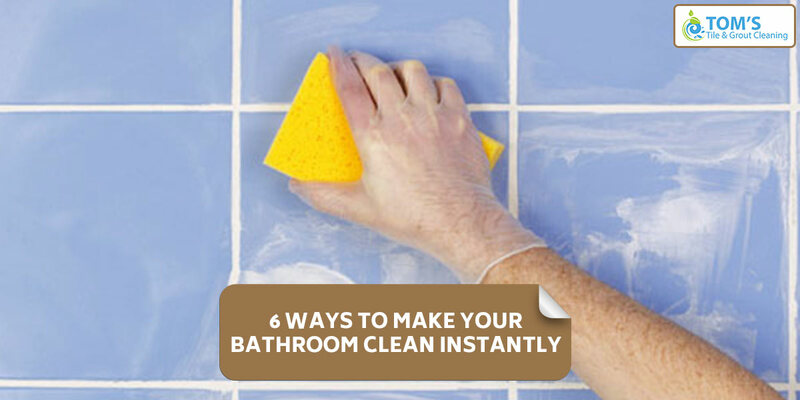 We have listed out tips that will give you clean toilets, holders, showers and also will do bathroom cleaning with it. The first thing you need to be cleaned is the bathroom mirror gets. It gets stained by water spots, makeup, toothpaste, soap foam, etc. giving a hazy and very ugly look. Spraying water or liquid cleaners and then wiping off with paper towels tend to leave a blotchy, streaky stain. So here’s our technique for you. Brew any tea really strong, use three tea bags of black tea and nothing else. Now cool it down. Pour the lukewarm tea in a spray bottle. Spray it on dirty mirror surfaces and this will get your mirror spotless. Use a newspaper instead of a paper towel to get the cleaner mirrors. Here is what you can do to clean those nasty looking shower knobs. It is not at all a pleasant sight looking at the dirty shower knobs. To scrub that nastiness away fill the shower panel with half vinegar and half dish soap. This will bust through shower grime and also help in bathroom tile cleaning as the mixture falls off on the floor tiles and the running shower can rinse it off. Thus with a clean shower, you also get your answer on how to clean bathroom floor tiles. You must have noticed impossible to move hard water stains. Those unseeable stains the pop up on your metal bathroom installations? Here is what you can do to get rid of them. To remove such ardent stains all that you need is a lemon. Scrub down the metal installation with just a lemon. The acid in the lemon will break down all the hard water stains. This all-natural trick will also make your bathroom smell great. Here is another method for you: Wrap the metal surfaces with plastic wraps. Soak this wraps distilled white vinegar first. Chemically the process is same, you are just using a different material. P.S. Use a toothbrush to get in hard to reach hooks and niches too. This one needs very little effort. When your toothbrush holder is dirty and unhygienic, clogged up with soap scum and grime here is a simple and an effective way to do it: Just toss the dirty holder in the dishwasher and let technology do the work for you. White vinegar can be called as the friend of your toilet. This all-natural bathroom cleaning solution kills mold, germs, bacteria along with giving it a clean shiny look. Here is how to use vinegar to clean your toilets. Pour Vinegar in the top of your toilet and let it sit and brush it off. You can use this for bathroom tile cleaning too. Also after bathroom tile sealing or any other repair work is done. You can use vinegar to clean off everything. Your toilet brush has the most amount of germs in it for obvious reasons and it is also very tricky to be cleaned. To get a clean toilet brush to pour a little all-purpose cleaner at the bottom of the brush holder. Let the cleaner run through the entire brush dripping off germs with it.